In August 2017 the BBC Who Do You Think You Are programme included a connection to the Tinworth family who were mining for gold in Australia. Knowing that we had Tinworths in the village, I looked up the connection and found that indeed Charles Tinworth who went to Australia was the brother of Edward (‘Ted’ I believe he was known as) who lived in Jasmine Cottage in the High Street. Click here to read this article. Shortly after this article was published I was contacted by one of our readers in Australia who very kindly sent me more information on Charles Tinworth who obviously ended up being a very successful man, so for those who would like to know more of Charles’s story in Australia, read on! 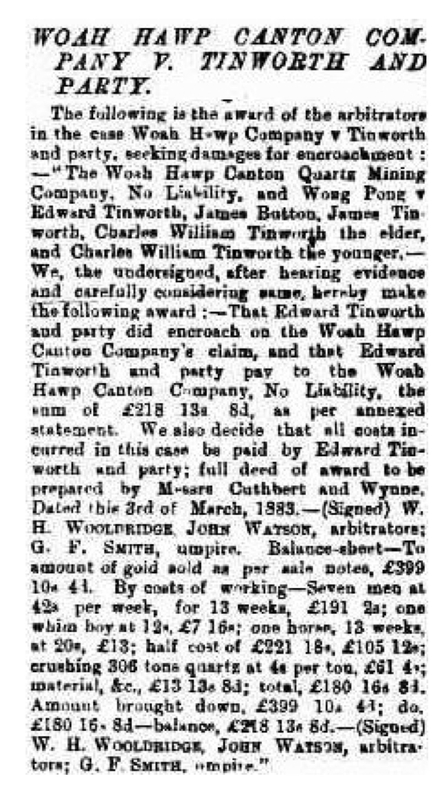 The following is the award of the arbitrators in the case Woah Hawp Company v Tinworth and party, seeking damages for encroachment: – “The Woah Hawp Canton Quartz Mining Company, No Liability, and Wong Pong v. Edward Tinworth, James Button, James Tinworth, Charles William Tinworth the elder, and Charles William Tinworth the younger, – We, the undersigned, after hearing evidence and carefully considering same, hereby make the following award:- That Edward Tinworth and party did encroach on the Woah Hawp Canton Company’s claim, and that Edward Tinworth and party pay to the Woah Hawp Canton Company, No Liability, the sum of £218 13s 8d, as per annexed statement. We also decide that all costs incurred in this case be paid by Edward Tinworth and party; full deed of award to be prepared by Messrs Cuthbert and Wynne. Dates this 3rd of March 1883. – (Signed) W. H. Wooldridge, John Watson, arbitrators; G.F. Smith, umpire. Balance-sheet – To amount of gold sold as per sale notes, £399 10s 4d. By costs of working – Seven men at 42s per week, for 13 weeks, £191 2s; one whim boy at 12s, £7 16s; one horse, 13 weeks at 20s, £13; half cost of £221 18s. £105 12s crushing 306 tons quartz at 4s per ton, £61 4s; material, &c., £13 13s 8d; total, £180 16s 8d. Amount brought down, £399 10s 4d; do. £180 16s 8d – balance, £218 13s 8d – (Signed) W.H. Wooldridge, John Watson, arbitrators; G.F. Smith, umpire. A complimentary banquet was tendered last night to Mr Charles Tinworth, the well-known miner, by a number of his friends, previous to his departure for Europe. The banquet was held in a marquee adjoining Mr Tinworth’s residence. About 70 gentlemen were present, amongst whom were… etc. etc. The next toast was “Health and Prosperity to Mr Tinworth”, all wishing him a pleasant journey and speedy return to the colony. The toast, which was drunk with musical (? honours), was responded to by Mr Tinworth in a neat speech. Mr Stephen Cuming rendered a song entitled “The Old Brigade”. The chairman then presented the guest of the evening with a handsomely-framed address, couched in eulogistic terms. The recipient suitably returned thanks. The following toasts were then proposed and responded to, viz: – “The Mining Industry”, “Pastoral and Agicultural Interests,” “Commercial”, “Local Bodies,” “The Press and Chairman.” The proceedings terminated shortly before midnight. 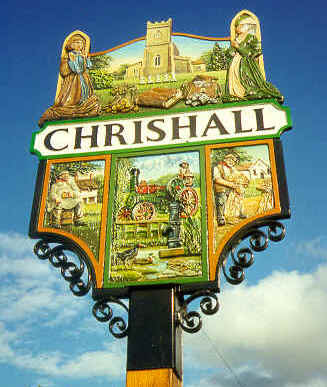 I wonder if Charles was heading back for a visit to Elmdon? So a very interesting life and quite a story. Charles did return after his European trip and died in Ballarat East in 1905. 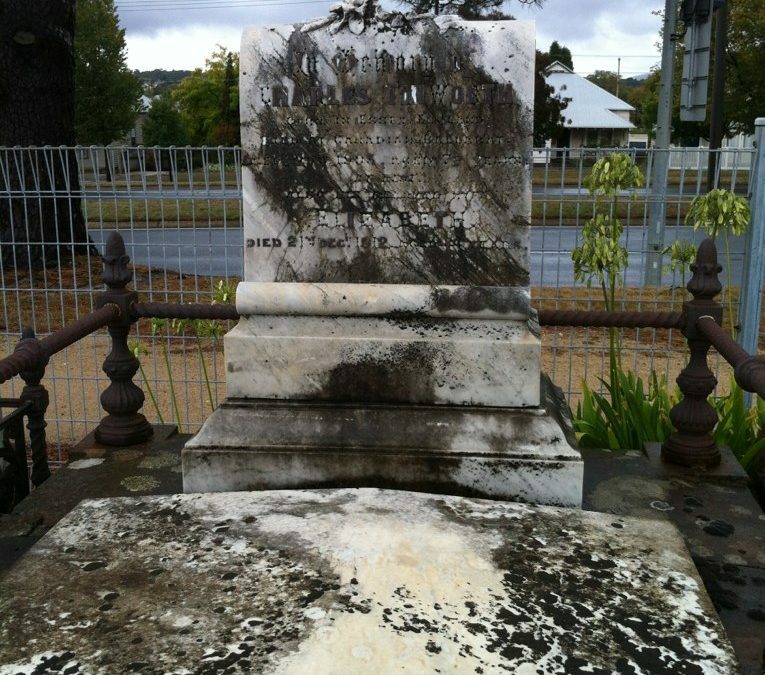 With many thanks to one of our Australian readers who provided copies of the articles and kindly took the photograph above of Charles’s grave.